Its summer, that means pool time and of course grilling! 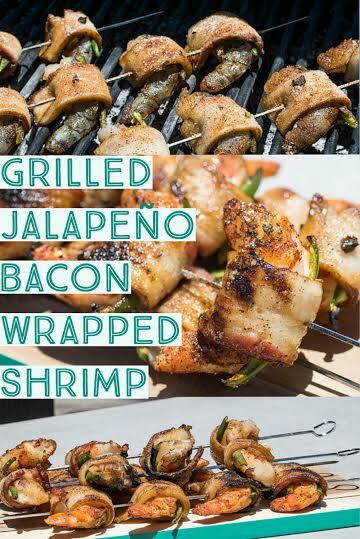 The Grilled Jalapeno Bacon Wrapped Shrimp became our 2nd Bacon Week recipe because we really wanted to utilize the grill somehow. Burgers weren’t really an option as bacon seems to play second fiddle to the burger itself. We wanted to create a recipe where the bacon was as much the star as whatever we paired it with. Grilled appetizers seemed like a good route to go because when you are by the pool, you don’t always want to stop to eat a full meal. 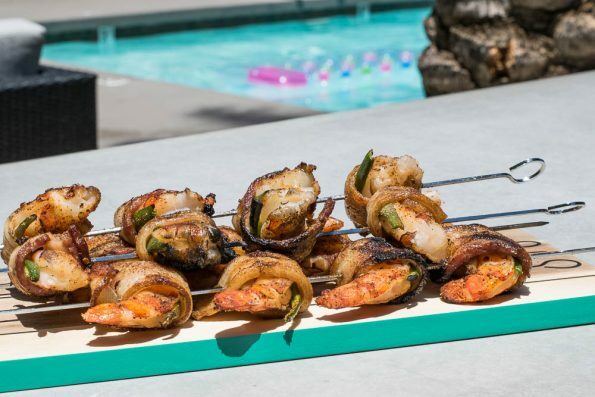 We actually tested the Grilled Jalapeno Bacon Wrapped Shrimp at a pool party and no lie, they lasted about 20 minutes. If you use the jumbo shrimp, they can also be served as a meal. 3-4 of them with a side is more than enough for a meal. You can’t lose if you serve these shrimp at party (unless your guests are kosher or have a shell fish allergy…)! They will be hit! Tomorrow we are posting a recipe for a salad that has kale AND bacon! Its like two of our most favorite ingredients (because who doesn’t love kale?!)! We still want to see all of your bacon pics! Be sure to tag with the special Bacon Week hashtag: #GWEBacon. These Jalapeno Bacon Wrapped Shrimp have a bit of everything! A little sweet, a little salty, and even a little heat. They go quickly, so you may want to make a few batches! Bake bacon on racks in a cookie sheet for 10-12 minutes (if using Whole Foods bacon or thick bacon increase time by 5-10 minutes, checking every 5 minutes) until bacon is partially cooked but still not entirely done. Allow bacon to cool enough to touch. Meanwhile, cut jalapenos into matchstick pieces the length of the shrimp (be sure to discard seeds and membranes). Take shrimp and place jalapeno into the top ridge. Season skewers to taste with seasoning blend. You will have a fair amount left afterwards. Grill over medium heating until shrimp and bacon are both cooked. If bacon starts to char before shrimp are done, move to indirect heat. If you don't want to make seasoning, you can use any grill seasoning that has a bit of sugar in it. This will allow caramelization of the bacon. Serving these at my next party! Yum! Wowwwww these look incredible! I wouldn’t even make these for a party, I would just eat these by myself! During the summer we grill at least three times a week. We’re always trying to find something different and my husband had just asked for kabobs. We’ll be serving this later this week. Oh my goodness this is going to be a hit at our neighborhood bbq! Love the spice rub ingredients! Grilling is great because it doesn’t heat up the house like the oven or stove. These sound like they are super flavorful. What a delightful twist to a jalapeno popper! Love the addition of the shrimps makes it like an upscale appetizer yummy! Now that would make a perfect appetizer to a summer party. Who doesn’t like shrimp and who doesn’t love Bacan.. Two faves in one bite. Yum! OMG! Totally decadent appetizer for any summer party! Wow, these look AMAZING! Definitely need to make these the next time we grill out or have friends over. Perfect for summer!